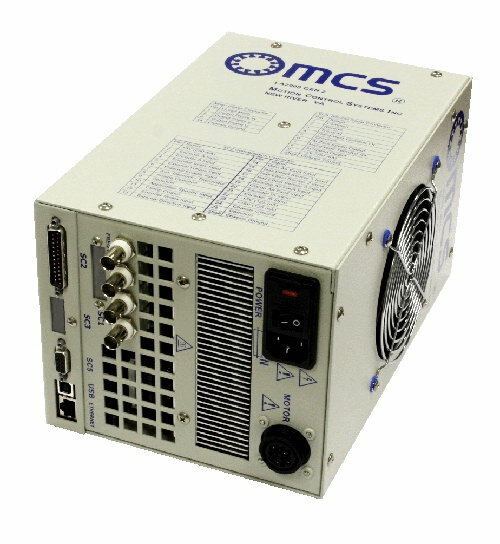 The LA2000 Generation 2 is the newest and most flexible linear brushless motor controller available from MCS. The GEN2 features an ultra-quiet linear power stage, built-in linear power supplies, and a variety of control modes ranging from the ultra-stable frequency-lock-loop to a simple analog torque control interface. The GEN 2 provides significant performance upgrades and connectivity options, compared to its predecessors and competitors, such as USB and ethernet. These enhancements will facilitate the next generation of high performance media testers, among numerous other precision applications. The GEN2 can be operated stand-alone via analog or TTL commands, operated with a host PC, or a combination of the two, as the application requires. Use of improved air cooling, current and temperature monitoring and protection circuitry, and an efficient linear power supply allow a continuous current rating of 8A peak sinewave and an intermittent current rating of 15A peak sinewave. Diagnostic features include motor speed, motor current, direction, fault status, and amplifier temperature measurement. In addition, the GEN2 provides several user interlocks, reducing circuitry required in the host system. Virtually any encoder and motor pole count combination is supported. The controller can be panel mounted using the provided threaded inserts or an optional mounting flange. 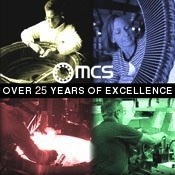 Other application-specific options are available, contact MCS with your needs and we will provide a solution. Ethernet - Provides a graphical web interface as well as telnet terminal control to emulate serial. Handheld control pendant - Useful for field testing and set-up without a computer. Not available with the position control option. Hardware - Dedicated hardware inputs are used in some operating modes eliminating the need for a PC after set-up. Encoder + Hall effects - Provides smooth sinusoidal commutation without an encoder initialization routine. Encoders can be single-ended TTL/CMOS or differential (RS-485). Analog (sinewave) encoders can be used as well with a factory installed option. An index pulse is not needed with Hall effects. Hall effect only - Low-cost trapezoidal commutation can be used for analog torque or analog velocity control. Sine / Sine+120 - Commutation is performed externally and the motor controller is provided directly with current requests. Input Voltage 115/230 VAC standard, user configurable. 100/200 VAC optional. © 2014 Motion Control Systems Inc.